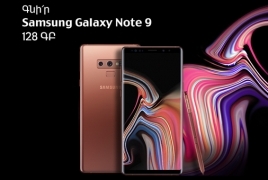 PanARMENIAN.Net - VivaCell-MTS announced on Saturday, September 1 that the Samsung Galaxy Note 9 (128 GB) is already available at its service centers. The smartphone costs AMD 524 900 and can be purchased both in cash and by installment. As reported earlier, those who buy (or have bought) a smartphone for AMD 30,900 or more from August 17 till September 30, will get a chance to participate in a prize draw of three KIA Rio X-Line cars and 15 Honor 9 Lite smartphones.